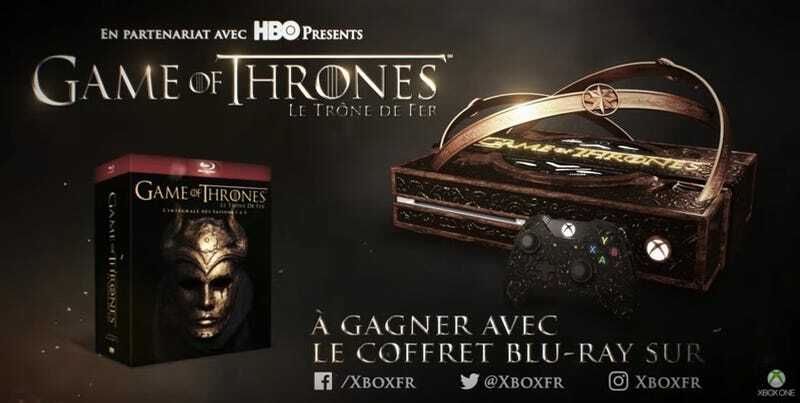 This ugly brown Game of Thrones-themed Xbox One is being given away as part of a sweepstakes in France. It would presumably look classy sitting on a shelf in Cersei Lannister’s boudoir. The special edition looks sort of like Cersei got drunk on cheap wine, carved a fancy wooden box, and inexplicably slapped some Xbox labels on it. Of course, the console is going to look thirty kinds of gaudy sitting in the living room of the lucky French Xbox fan who wins it. And you know what isn’t cool — besides the shameful attempt at capitalising on a megatrend? That godawful crown the Xbox One is rocking. Is that a handle for when you fling it at peasants? A cradle to hold the massive nutsack you’d have to be for showing this off in your living room?